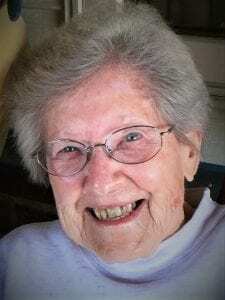 Lucille Bliese, 94, of Gettysburg, died Wednesday, March 20, 2019 at the Avera Oahe Manor, Gettysburg. Funeral services were Sunday, March 24 at the United Methodist Church, Gettysburg, with Pastor Jeff Adel presiding. Burial was in the Gettysburg Cemetery. Lucille A. Willey was born Aug. 15, 1924 in Forest City, SD to Charles and Anna (Sternhagen) Willey. The family moved to Montana when she was two years old and returned to Forest City when she was eight years old. She resided there until age 18. Lucille attended Forest City School from fourth through eighth grade and graduated from Gettysburg High School in 1942. Lucille was united in marriage to Gary W. Bliese in Sauk Centre, MN on Dec. 26, 1943. They worked in Hanford, WA and Minneapolis, MN before settling in Gettysburg. They had one son, Mick who was born in 1945. Lucille worked as a bookkeeper in several businesses before going into their own business, Bliese Machine Shop, retiring in 1998. Grateful for having shared her life are her grandson, Kevin (Kristi) Bliese of Bath and their son/step-son Bridger and Connor; daughter-in-law, Marty Bliese of Gettysburg and her children Heidi and Wade; brother, Jim (Pat) Willey of Gettysburg and their sons Bob and Chuck; sister-in-law, Dorothy Willey of Gettysburg and her daughters: Betty, Barb, Candy and Joanne. She was preceded in death by her parents, Charles and Anna Rose (Sternhagen) Willey; husband, Gary Bliese; son, Mick Bliese; sister, Margaret (Willey) Underwood; brothers, John and Donald Willey; and brother-in-law, Don Underwood. Please direct memorials to: Avera Gettysburg Foundation, 606 E. Garfield Ave., Gettysburg, SD 57442.